Membership in this service allows you to follow the details of the BlueSky Account, the EquiFund and much more. Upon membership signup, you will receive a welcome email packet with a login and password to the Member’s Area of the OptionsWest website. Included with this email you will find information about our Trading Service, access to our Learning Center, and instructions directing you how to download our helpful software tools. 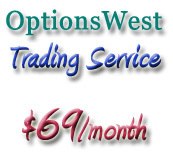 Please feel free to call us with questions about how to use the OptionsWest Trading Service effectively or with inquiries about any of our trading courses. The Trading Service is billed monthly from your membership signup date and you may cancel at anytime. Investing in the market can sometimes seem like a real puzzle, but it does not have to be that way. Successful investors make a great income from the market, while amateurs tend to just get frustrated. OptionsWest would like to help you solve the puzzle and start enjoying the returns that can be achieved in this business. The education OptionsWest offers is not taught in any college class, wealth building seminar, or infomercial. The skills and techniques taught in our courses and shared through membership in our Trading Service are the tools of professional investors. Years ago, when we were looking for guidance on how to invest successfully, we found virtually nothing available outside of hyped up books and wealth building seminars. These infomercials presented big promises, but delivered more questions than answers and little trading success. The OptionsWest approach employs conservative and straight-forward trade-desk skills, combined with the tools and opportunities the information age provides today’s investor. Our “Successful Stock Investor” course and the OptionsWest Trading Service provide a complete education in learning the risk management skills necessary to succeed in the market. We recommend you invest the time to fully utilize your membership in the Trading Service and especially your access to the member’s area of the website. Studying our approach and systematically following our example trading accounts ( BlueSky and EquiFund) is a good path to learning how to run a successful trading account.